Shortly after Trump himself defended his campaign manager, Corey Lewandowski, against allegations of assault, yet another violent incident occurred at a Trump rally in Janesville, Wisconsin. A video posted to the Janesville Community Page shows a confrontation between a 15-year-old blonde girl protesting the rally and a white-haired man. The girl, who police say was groped just before the incident, appears to confront the man and attempts to punch him before an onlooker sprays her in the face with pepper spray. A reporter for the Wisconsin State Journal was standing near the scene and managed to capture some stills of the incident. 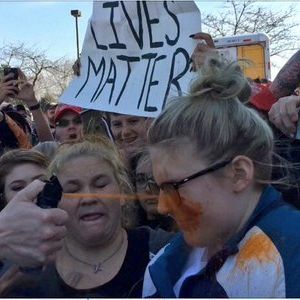 It’s unclear who’s wielding the pepper spray in question, but police say the victim received medical treatment. The Janesville Police Department said in a statement that it’s “looking for two suspects: one for the sexual assault and one for the pepper spray.” A 19-year-old woman standing near the victim was hit with “secondhand spray” and was also treated at a local hospital. This is the most recent in a string of violent incidents that have occurred at Trump rallies across the country, some involving bystanders and others involving journalists, and Trump himself said he’d “look into” paying the legal fees for a supporter who sucker-punched a protester in the face back in March. Suffice to say, it’s probably a good thing the Secret Service won’t let voters bring guns to the Republican National Convention.